This article is about the Infocom game by Steve Meretzky. For other usages, see Sorcerer (disambiguation). You are the Enchanter who defeated Krill. You are in a twisted forest under attack by a hellhound. Internal/Working title was Zork V or Z5. Sorcerer (Steve Meretzky; publisher: Infocom; 1984; Z-code 3). Sorcerer (Steve Meretzky; publisher: Infocom; 1984-85; Z-code 3). 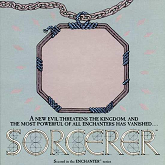 Sorcerer is available on the Classic Text Adventure Masterpieces of Infocom CD. Sorcerer (video game) at Wikipedia. This page was last modified on 20 October 2014, at 04:39.